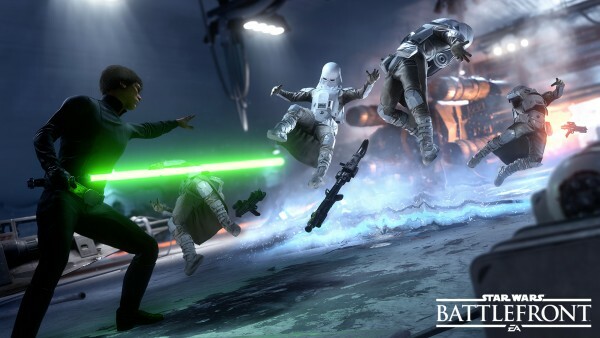 Is the Force strong with this Battlefront reboot? Star Wars Battlefront comes from DICE, who of course make the Battlefield games so we know we are in good hands when it comes to them making a shooter. 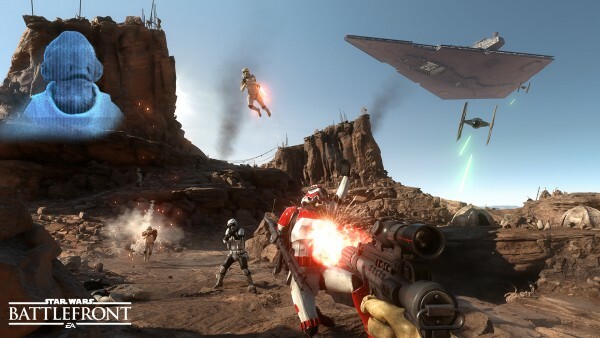 Battlefront doesn’t have a campaign as such, but it does have single/co-op missions with side objectives and collectables, although these are really a mixture of survival and just wiping out as many of the enemy as you can before they hit the target score, there are also training missions that get you prepped for the main course of the game…which of course is the multiplayer. There are 9 different game types to choose from in your multiplayer outing, these can vary from variants of CTF, Team Deathmatch, King of the Hill and Juggernaut. Of course these all have different names but are essentially those types of modes, there’s also a mode where you are all in either X-Wings or TIE Fighters in a real dogfight in the skies. The Juggernaut mode picks one player to be a Hero or Villain character and has to get as many kills as possible before the player who gets the killing blow becomes the next one and so on. The Hero/Villian roster currently includes Luke Skywalker, Han Solo, Princess Leia, Darth Vader, Emperor Palpatine and Boba Fett. Each of these have their own individual talents such as lightsabers, death chokes, lightning hands, jetpacks and stronger blasters. They all take a bit of getting used to, but are superb in their own way. There’s one mode that pits all of them against each other, while having other players help to take them out or protect their Heroes/Villains. Also in some objective based modes, you can get Hero tokens that let you become them mid-battle, you can also take control of AT-ATs during the Battle of Hoth map. The level of customisation and upgrades are impressive, there are only a number of blasters to get and you don’t get ammo, but instead you can overheat your weapon if you shoot too much and have to cool it down. You also get Cards to pick for your matches, these can offer basic things like certain types of grenades, instant cooldown of your weapons or stronger blasters for a few shots, there are plenty of others and more will most certainly come via DLC, as will new Heroes/Villains, maps and weapons. Across the battlefield you will also find tokens that let you place turrets, give you homing rockets or proximity bombs and if lucky, let you become a Hero or Villain or ride a vehicle like an X-Wing/TIE Fighter or even an AT-AT. The scale of some battles are immense with land and air fights taking place at the same time and the number of players at once is impressive to say the least. I didn’t really come across any lag during any matches, load times were also quick. Visually, this is the best looking Star Wars game to date. You really feel like a Stormtrooper or Rebel Soldier fighting it out in the trenches of Hoth or the desert wastes of Tatooine. Of course fighting Luke Skywalker as Darth Vader or vice versa is epic, as are the other battles you will come across. Sure, it’s not canon as Luke and Vader never fought on Hoth, but it doesn’t have to be. This is just a dream scenario for Star Wars fans that (despite Breaking Benjamin’s lead singer’s very vocal opinion on the game) is a match made in heaven. There’s tons to do and unlock, but I do wish they had more than 6 hero/villain characters to play as. I know we will get more through the Season Pass, perhaps Chewbacca or Yoda? Although I do imagine Yoda being very hard to shoot, much like Oddjob was in GoldenEye for the N64. It would be neat to get Darth Maul and Count Dooku too or maybe even teenage Anakin before he succumbs to the Dark Side? Then there’s young and old Obi Wan, not to mention the new villain from Episode 7, Kylo Ren. The possibilities are endless when it comes to the Star Wars universe, so expect to see a lot of content coming for Season Pass owners. Having said that, DICE have promised to release a lot of free DLC too, so it’s good either way. 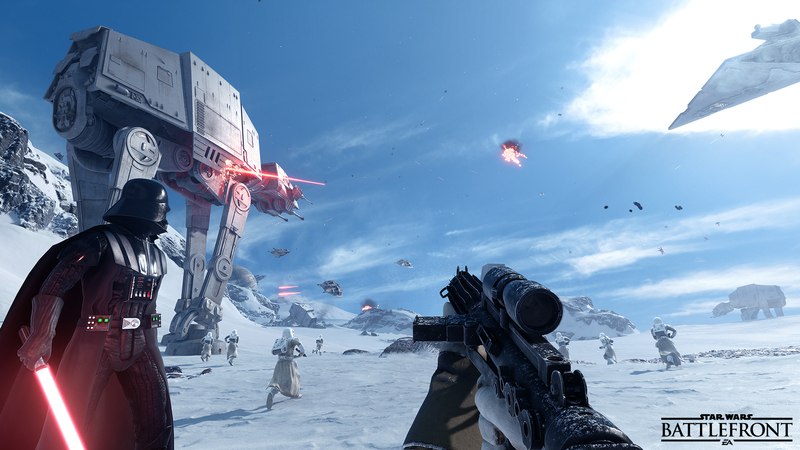 Star Wars Battlefront is the strongest game in the series to date. It makes any battle scenario you’ve imagined come to life and there’s plenty more on the way via DLC. DICE and Star Wars make the perfect combination in creating what fans have dreamt for years. Let’s hope the post-game content is as strong as this and it will be a huge contender to the online shooter battlefield.